Dr. David Aria is a radiologist based in Phoenix, Arizona. He graduated from the Temple University School of Medicine and continued with an internship at the Frankford Hospital. 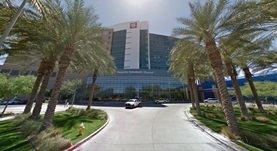 Afterward, he completed a residency stage in radiology at the Staten Island University Hospital, followed by two fellowship stages in radiology and pediatric radiology at Phoenix Children’s Hospital. Dr. Aria is a board-certified specialist in diagnostic radiology. He has also contributed to the research field with two published studies that focused on percutaneous cholecystostomy effectiveness in children and greater saphenous venous access. At the moment, Dr. David Aria is affiliated with the Phoenix Children's Hospital. Dr. David J Aria has contributed to 2 publications. Safety and effectiveness of percutaneous cholecystostomy in critically ill children who are immune compromised. Schaefer, C. M.,Towbin, R. B.,Aria, D. J.,Kaye, R. D.; Pediatr Radiol. 2016 Feb 18. Greater saphenous venous access as an alternative in children. Aria, D. J.,Vatsky, S.,Kaye, R.,Schaefer, C.,Towbin, R.; Pediatr Radiol. 2013 Oct 08.